Trust me. You don’t want to get caught unprepared. Someone stole my wallet a few weeks ago. I felt violated on multiple levels. There was the loss of my sense of physical safety, the loss of my bank cards and cash, the loss of my only valid form of ID and the loss of the sense of security that these things brought. Just as disruptive were the time and energy it would take to replace everything. Once I collected myself from the initial shock, which may or may not have involved tears and tissue, I did what I do best — I made a list. I listed everything I needed to do and in what order. This list lengthened with each day as I realized how much the theft impacted my life, financial and otherwise. I lamented. Why wasn’t I prepared for this? Why hadn’t I prepared for the worst and assembled a wallet loss preparedness kit, like the earthquake preparedness kits my elementary school teacher had our entire class create? So consider this my gift to you: A handy guide to creating your very own wallet loss preparedness kit. I hope you never need it, but it’s nice to have should you find yourself walletless one day. Automatic bill pay for phone, car, insurance, home expenses, cable, etc. Subscription services for clothes, food, etc. If you don’t trust your memory, check your bank statements for recurring payments. I bank online, so I logged in to my spending report and typed, “recurring” in the search box, which highlighted all of my recurring payments in yellow. Another option is to review the detailed year-end spending report many financial institutions provide or check your cell phone for apps linked to your cards. With a valid, government-issued photo ID, you can replace anything you lost and prove to institutions you are who you say you are. Be sure to keep a current state ID or a current U.S. passport outside your wallet in case you need to prove your identity. Other forms of ID that help include a social security card, a certified copy of your birth certificate, a current vehicle registration and voter registration card. Don’t be like me and try to convince the security guards at CBS television and the personnel at Wells Fargo that you are you by showing them your website. It doesn’t work. Most of us keep our medical cards in our wallets so they are easily accessible in an emergency. Make sure to keep extra copies of your medical cards someplace safe at home. You can easily obtain copies by either requesting them from your healthcare provider online or daring to call customer service. Please note that cards usually take up to 10 business days to arrive in the mail. If you need them sooner, some companies allow you to print temporary cards via their online systems, while others will simply tell you your ID number over the phone (after you’ve answered a series of security questions). 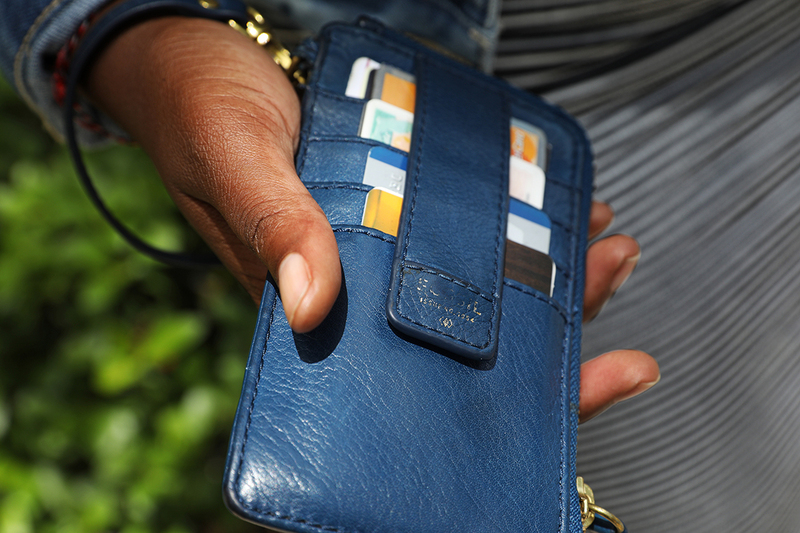 That’s worth repeating: Make a list of everything in your wallet. If you want to be an overachiever, make a copy of everything in your wallet. Update this list regularly, either quarterly or monthly. It’s as easy as taking pictures of your wallet’s contents with your cell phone and making sure they’re backed up on the cloud (Google Drive, Office 360, etc.) or keeping the physical copies someplace safe in your house. Hint: your mattress is not a safe place, but a locked, fireproof box tucked away in your garage might be. Make sure you have the contact information and account numbers for all of your financial institutions in a safe place at home, on your computer or in the cloud. You will need access to this information to get replacement cards and keep your accounts protected. Many auto clubs and financial institutions offer their customers these services for free or at reduced rates. They alert you of fraud and help you protect your identity and finances in the event of theft. You can also try credit monitoring sites, like Credit Sesame. They will alert you if anyone attempts to open a new account in your name, and you can track your credit card balances. Did you know that 28% of Americans don’t have an emergency fund? Don’t be another statistic, especially in the event of an emergency. Find a safe place, like the aforementioned locked, fireproof box, to keep cash or a prepaid card with money on it. This will ensure you have immediate access to money if you lose your wallet. In her former life, Chanté Griffin taught kids how to make and manage money as the director for a financial literacy non-profit. Today, she teaches herself how to make and manage money as a freelance writer and actor.